An Arizona woman is accused of abandoning her two daughters at a park, charging her with neglect. 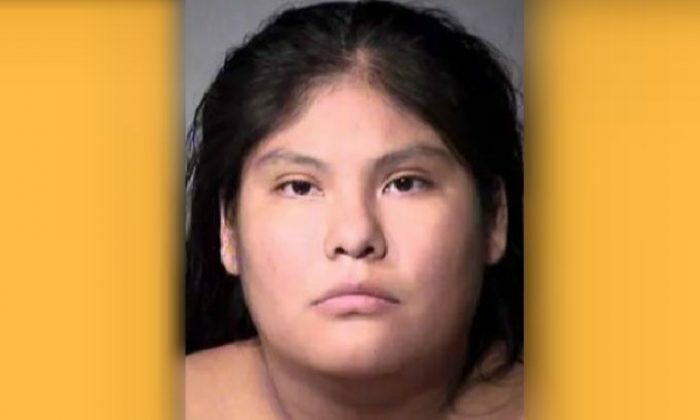 Valerie Hazel Carlisle, 23, is facing charges of child abuse for allegedly abandoning the girls, a 2-year-old and a 9-year-old, AZFfamily reported. She left them in a park in Mesa, telling them to wait for her. The 9-year-old told officers that her mother left them at the park, saying they waited for at least an hour. They were cold and scared and weren’t wearing jackets, the report said. The older girl knew they were to stay with Adrian Joaquin, the grandfather of Carlisle’s boyfriend, and walked to his home at a nearby apartment complex. They knocked on a few doors before they found Joaquin’s apartment. Joaquin then called the police after they showed up there, the report stated. Police said that Carlisle and her boyfriend have another 1-year-old child, and she has custody of a 9-year-old and 14-year old. To make matters worse, police stated that the girls were left in an area that’s frequented by homeless and transient people, and intoxicated people, according to AZFamily. Broken bottles were located near the two girls. Carlisle was taken into custody at 2:30 a.m. on Saturday, saying she blew a 0.15 during a breathalyzer test. They released her on her own recognizance, and she’s slated to appear in court weeks later. For people who think a child is being neglected, the Childhelp National Child Abuse hotline is available at 1-800-422-4453.